Gold Eagle Coin Holder – Which One To Choose? Gold Eagle coin holders are designed to provide an excellent protection for your prized gold coin collection against potential damage of environmental factors and handling. Gold Eagle coin holders come in a variety of styles, materials, decorative elements and price ranges. You can pick simple plastic Gold Eagle coin holder that will provide basic protection or superior air tight seal holders that are intended to prevent excessive tarnishing of your gold and silver coins. One of the best places to buy coin holders are multiple Internet auctions, including EBay where you can choose from an array of holders and also find rare EBay gold coins. 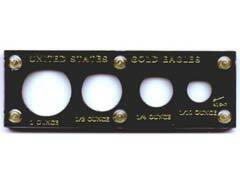 When considering basic plastic snap lock Gold Eagle coin holders for storing your coins, look for the ones that contain no PVC (polyvinyl chloride) ingredients that can potentially damage your coins and are considered toxic to humans. If you have a substantial collection of multiple Gold Eagle coin mintages, you will definitely need to invest in a high quality durable coin album that is a safe and convenient way to organize your numismatic collection. For rare Gold Eagle coins that hold a special place in your numismatic collection, opt for more aesthetically appealing Gold Eagle coin holders that will not only preserve the quality of your possessions but allow you to create a special setting for your coins to stand out. Velvet clamshells and solid wood Gold Eagle coin holders are some of the top selling special occasion holders that are not only great for storing but also fantastic for gift giving. It’s interesting to know that the preferred choice of museums and private mints are airtight gold coins holders that provide an additional level of protection by including special gasket gold coin rings intended to hold especially rare and prized coins and to prevent them from moving inside the holder during transportation or handling. For those numismatists who love to show off their rare coins or gold bullion coins, one of the preferred choices should be custom made wood plaques that can hold a single coin or multiple coins depending on your collection needs. If you would like to commemorate a Gold Eagle coin to a newborn child in your or your friends’ family, you can choose from a variety of high quality plastic holders that will allow you to place a coin in a beautiful setting and complete it with a child’s photograph and a year of birth. This makes one special gift that will be cherished for years to come that also has a terrific intrinsic value.